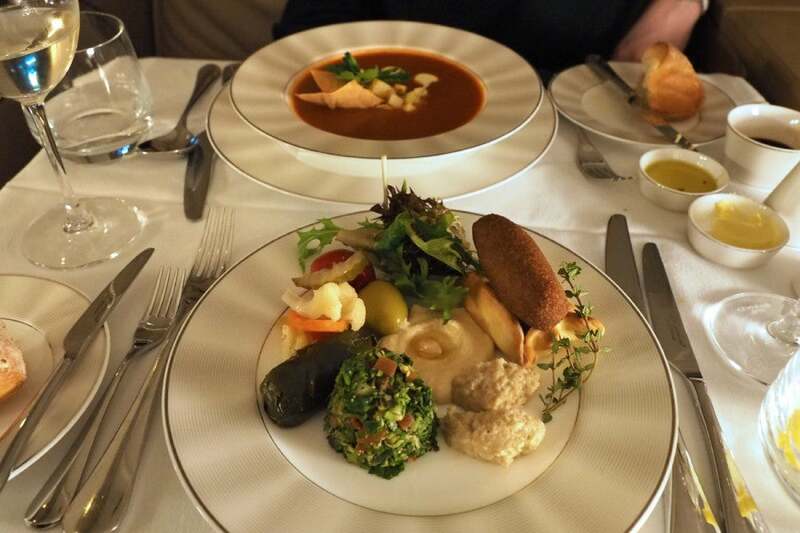 Last week, TPG Editor-in-Chief Zach Honig flew The Apartment on Etihad’s A380 from Sydney to Abu Dhabi. 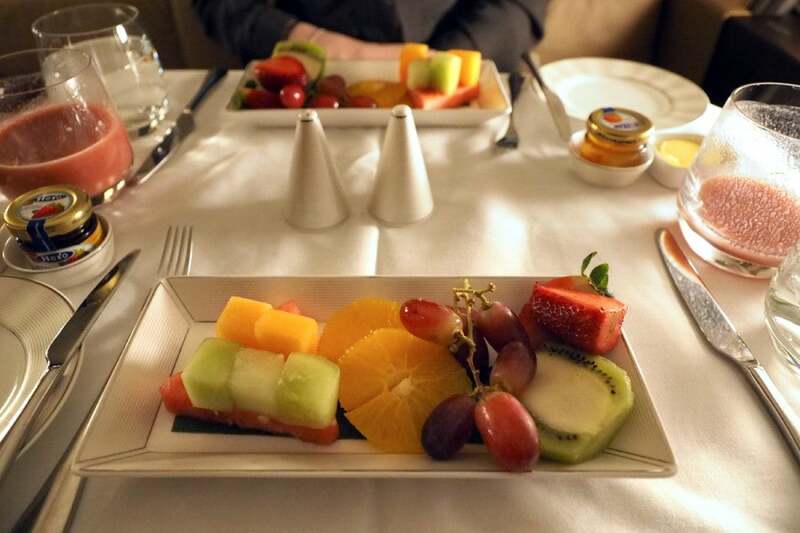 Here’s what it’s like to travel in the world’s best first-class suite. I’ve never been so excited to fly. 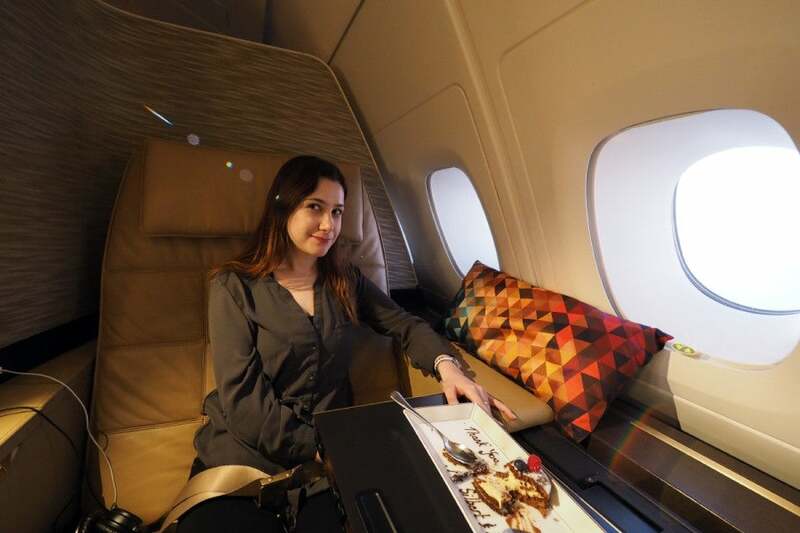 Etihad’s Airbus A380 is arguably the most extraordinary plane in the sky — its first-class Apartment makes Emirates first class and even Singapore Suites seem a bit less appealing, while The Residence, with its three private rooms, is in a class all its own. 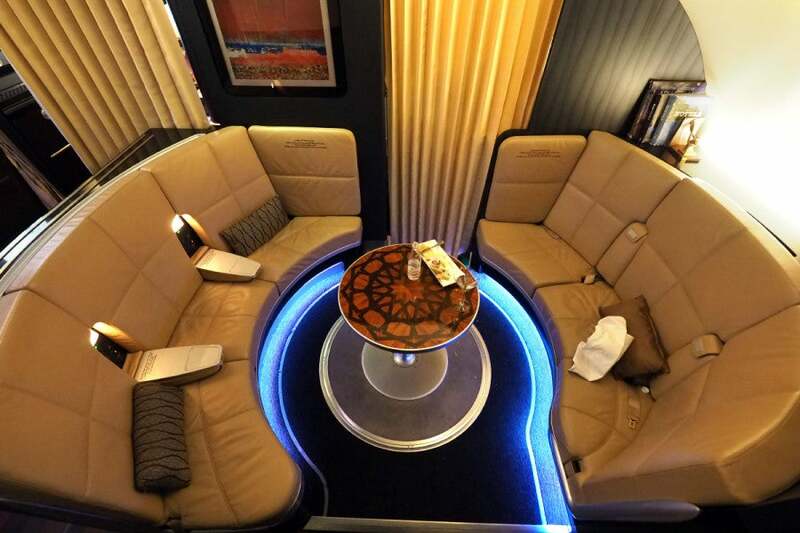 Of course, Emirates’ A380 first class and Singapore’s A380 Suites are still two of the most luxurious options for a long-haul flight, but with a single-aisle configuration and more personal space than what you’ll find on any other carrier, The Apartment is the new first class to beat. 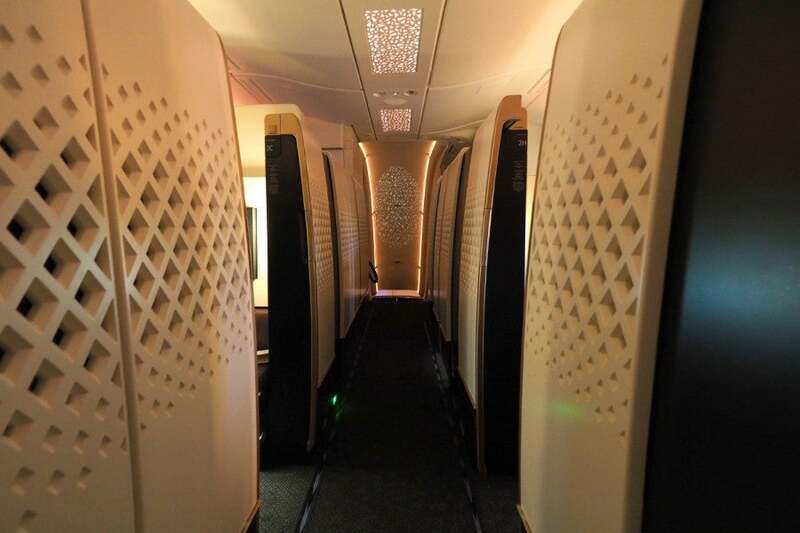 When Etihad introduced its Airbus A380 in the summer of 2014, I knew I’d have to fly it soon. But a six-hour leg from London to Abu Dhabi wasn’t going to cut it. So when I heard about the new Sydney service launching in June, I knew that’s the route I would fly. 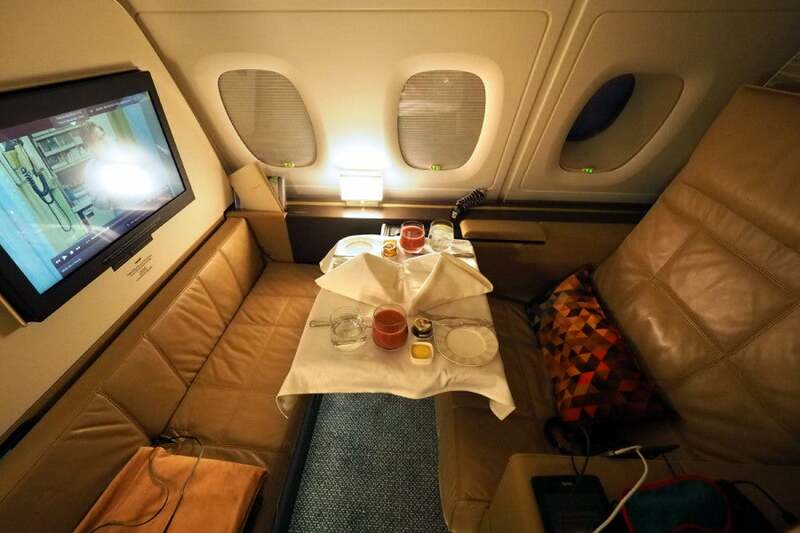 With a few exceptions, I don’t book flights without a plan to spend several days at the destination, and since my girlfriend Sarah and I had never been to the Maldives, I decided to tack on a four-hour flight from Abu Dhabi to Male. Our booking from Sydney to Male via Abu Dhabi. Considering a 12.5-hour flight from New York to Abu Dhabi will run you 90,000 American AAdvantage miles, the 14-hour flight from Sydney is a relative steal at 60,000 miles each way. (With the sign-up bonus currently at 75,000 miles after you spend $7,500 in the first three months, you’ll earn enough for a one-way flight in The Apartment with the Citi / AAdvantage Executive World Elite Mastercard.) We paid less than $100 in taxes and fees per person, and while AA wasn’t yet waiving the phone-ticketing fee for flights that can’t be booked online, the AA Australian call center rep I spoke to was willing to waive the fee when I asked. If paying cash, the one-way flight from Sydney to Abu Dhabi would have run me just over $9,950 AUD (about $7,350). 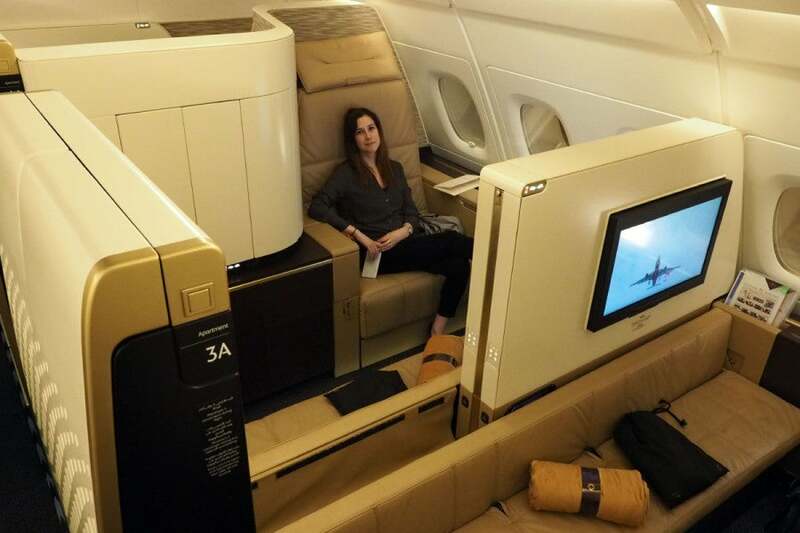 If booking as a round-trip, however, that fare drops to $7,150 AUD (about $5,275) each way, which actually isn’t terrible for more than 14 hours in the world’s best first-class suite. Assuming I would have booked the round-trip, I got 8.8 cents in value for my 60,000-mile redemption. Booked as a one-way flight, however, I got a superb 12.2 cents in value for this redemption, not including the “free” connecting flight to the Maldives. 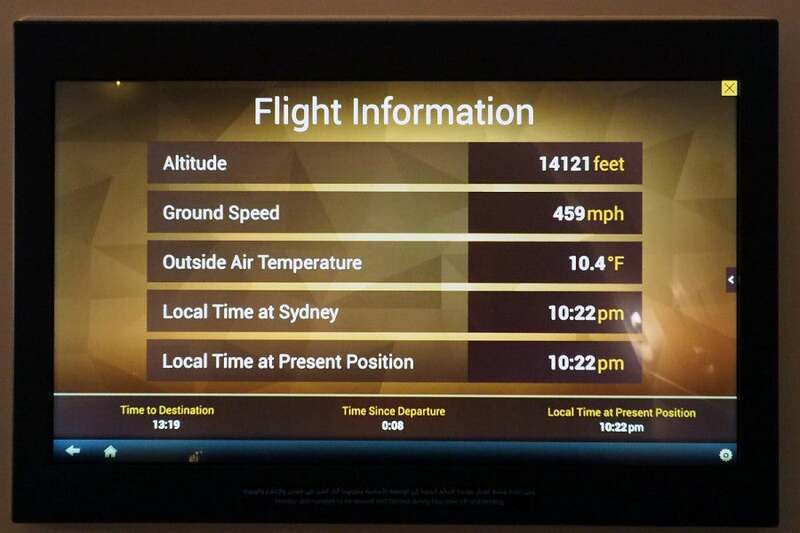 Our flight was just under 14 hours, covering 7,500 miles from Sydney to Abu Dhabi. Of course, we also had to get to Sydney. I found a decent fare from New York to San Diego, San Diego to Sydney and Dubai to New York for $2,950, with New York to Sydney booked in upgradeable economy on United and Dubai to New York booked in business on Swiss. I had originally planned to fly on an AAdvantage award on Cathay Pacific to Bangkok, a United award on Thai to Sydney and another United award on Swiss from Dubai to New York, but considering I needed the PQMs and PQDs to re-qualify for United’s top-tier 1K elite status, the (more direct) paid itinerary made more sense. 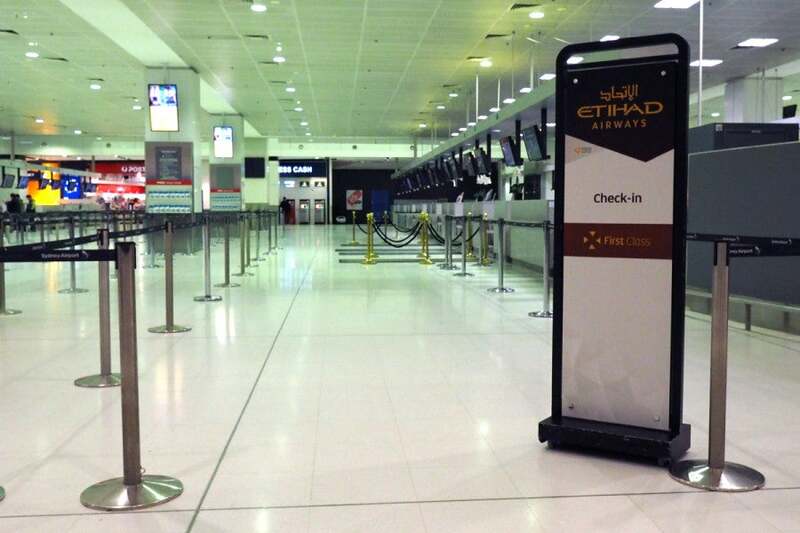 The check-in experience at SYD felt anything but first-class. I had booked Etihad’s complimentary chauffeur service, which is available to all first and business-class passengers — when we checked into Sheraton on the Park in Sydney (review coming soon! ), the hotel passed along a message from Etihad confirming a 7:30pm pickup for our 9:25pm flight, which seemed a bit tight, especially since I was hoping to board early to take some pictures of the lower deck and The Residence. I called Etihad twice in an attempt to change the pickup time to 6:00pm, but the representatives I spoke to were only able to send an email to the dispatcher — I was told to expect a confirmation call within 24 hours of departure, but that call never came. Our hotel seemed eager to get us out of our room (despite the confirmed 7pm departure), so we left early via Uber and arrived at the airport around 5:30pm. It was the first time I’ve ever arrived at the airport before check-in even opened (I typically cut it pretty close), but after a 20-minute wait the check-in counters opened and we were on our way. 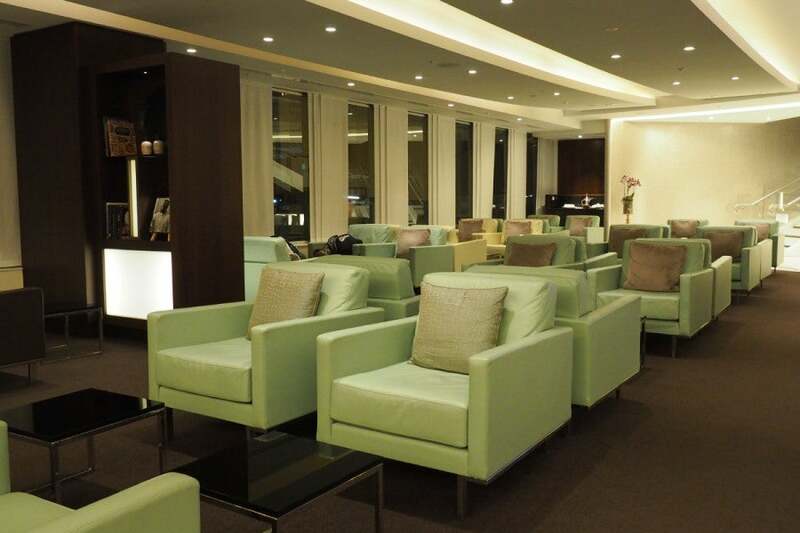 Etihad first and business-class lounge (Sydney). After a stop at the tax refund office and some time at the duty free shop (the weak Australian dollar makes for some good deals), we headed to the Etihad business and first-class lounge. 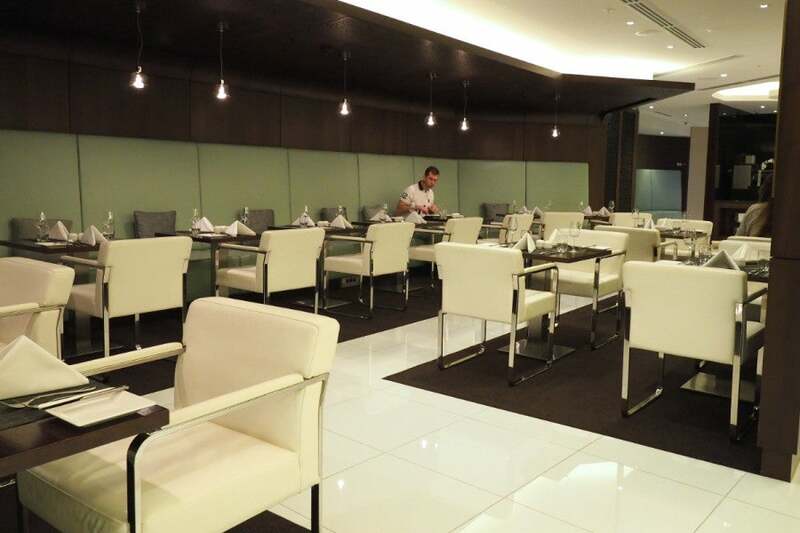 The lounge is open to first and business passengers, along with Etihad Guest Platinum members. 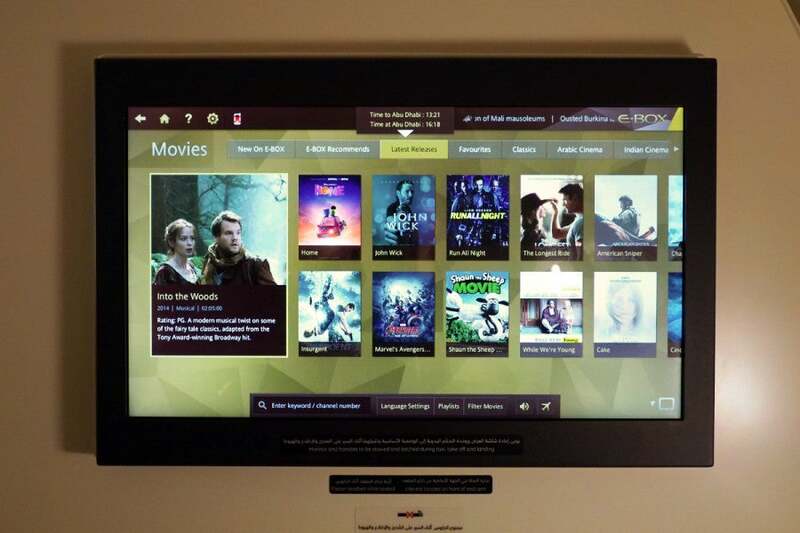 Virgin Australia elites can also use the lounge when booked on Etihad’s 777 or Virgin Australia’s flight to Abu Dhabi, but not when flying on the A380 (due to the lounge’s relatively small size). 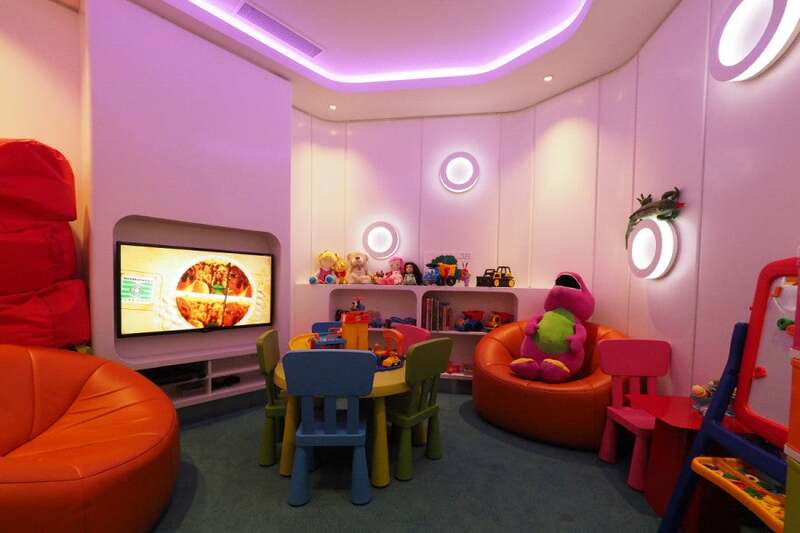 Family playroom at Etihad’s Sydney lounge. The lounge isn’t huge, but Etihad has managed to pack in plenty of amenities, including a colorful family playroom. The dining room at Etihad’s Sydney lounge. We spent the first 30 minutes or so in the dining room, which offers waiter service in addition to a small buffet. You can choose from a rotating selection of meat and veggie appetizers and entrees, along with a handful of desserts. 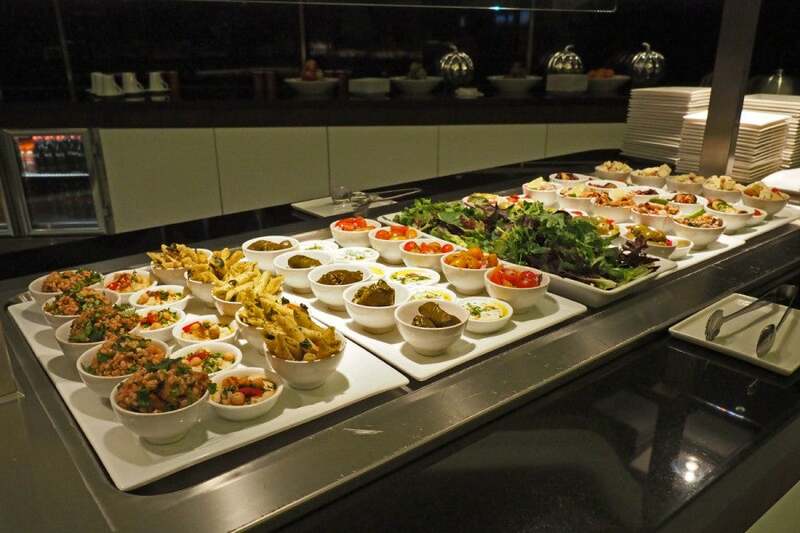 The salad bar at Etihad’s Sydney lounge. Since breakfast was our last meal many hours before, I opted to order a couple of items from the menu in addition to checking out the buffet. I settled on a bowl of hummus and some pita bread. 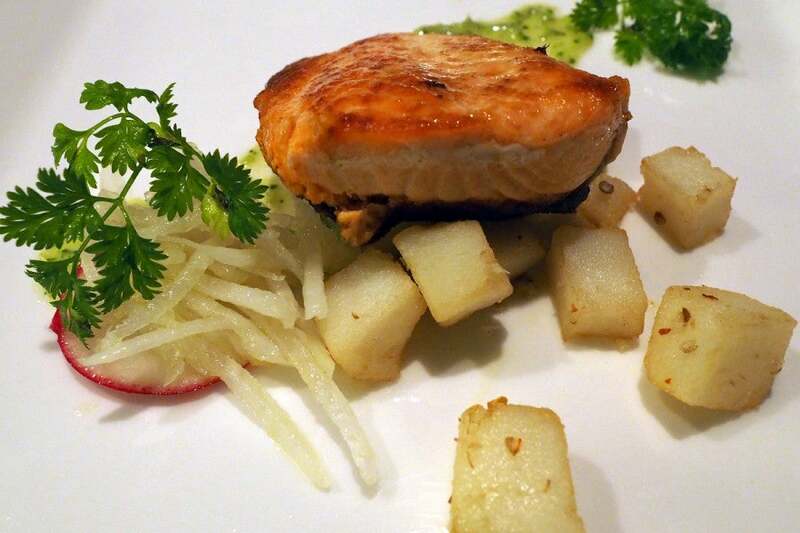 My salmon entree at Etihad’s Sydney lounge. Then, I devoured two entrees, including the salmon filet above. The food was excellent and our waiter was incredibly accommodating and friendly. He recommended wine pairings based on our entree selections. About 15 minutes before boarding, we were escorted by the lounge manager to the gate. I had pre-arranged early access with Etihad, including a few minutes to explore The Residence, which sadly isn’t available to book with AA miles. 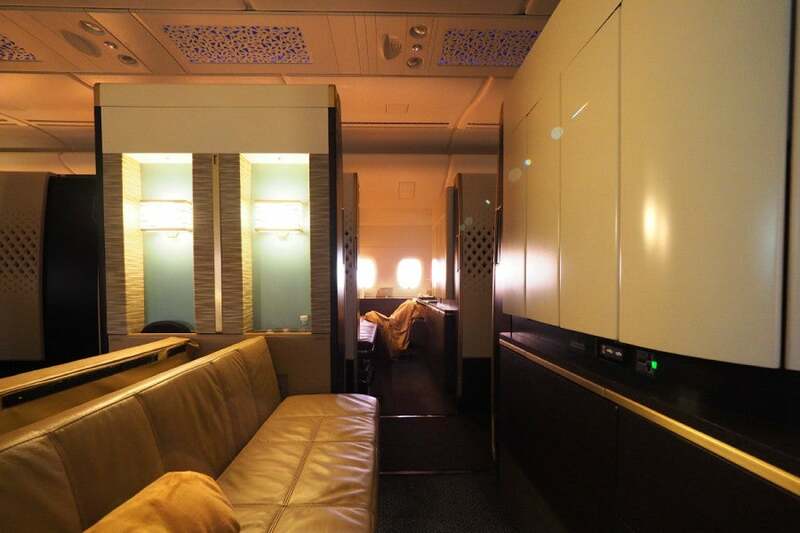 Etihad’s first-class cabin contains nine Apartments, plus the Residence. I chose seat 3A, which faces backwards, while my girlfriend was in 4A. Apartments in rows 3 and 4 are connected by a partition that slides down, so you can communicate with a travel companion (and even sleep side-by-side in a semi-double bed). Rows 3 and 4 are ideal even if you aren’t traveling with someone else, as these seats are positioned on the window side of the suite rather than next to the aisle. The partition was already lowered for us when we arrived, presumably because we were booked together on the same reservation. The first-class cabin consists of nine Apartments, plus The Residence. I was in awe as soon as we walked through the door. 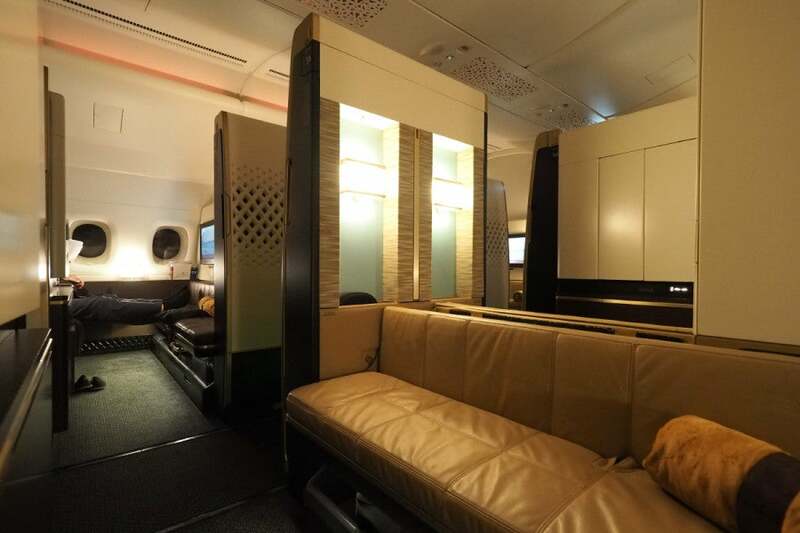 Etihad’s Apartments are located on the upper deck, which, while about two feet narrower than the lower deck, which some airlines (including Korean Air) use for first class, is still incredibly roomy, especially given the single-aisle configuration. There’s a surprisingly amount of detail, from the carved suite doors to the ceiling projections in the cabin, Residence and bathroom. With a partition that lowers, seats in rows 3 and 4 are ideal for couples. The Residence is located up front (where seat 1A would be). I’ve been keeping an eye on availability on this route for the past few weeks, and a few weeks after my flight, and I didn’t find a single date that The Residence wasn’t still available. Of course, at more than $27,500 AUD (about $20,300) for the one-way flight, it’s priced out of reach of ordinary travelers like myself. From what I can tell, Etihad never upgrades Apartment passengers to The Residence, and if it isn’t booked, other guests aren’t permitted to enter. I chose suite 3A, which faces toward the rear. I had spent plenty of time looking at marketing photos and reading trip reports during the weeks leading up to the flight, but photography really doesn’t do this suite a justice. It’s far roomier than anything I’d previously experienced on an airplane, with meticulous attention to detail. The design is fantastic. Each Apartment includes a sofa long enough to accommodate three guests. Of course, calling this thing an “apartment” is still a bit of a stretch, but for a seat on an airplane, the space is unparalleled. The sofa alone makes the suite very special, with enough room to accommodate several guests. As both seats are next to the window, you can’t see your companion during takeoff and landing. I was also pleasantly surprised at how much roomier the suite felt with the partition lowered. If you’re traveling with a companion, you’ll definitely have more room to stretch out with two connected Apartments rather than one Residence, so keep that in mind before you shell out $20,000+. Sarah in Apartment 4A. The partition between 3A was already lowered when we arrived. In rows 3 and 4, the sofas face one another, which comes in handy when it’s time to fold them down for bed. A touchscreen located under the armrest includes seat and lighting controls. The Apartment is incredibly “state-of-the-art,” with touchscreen controls for everything from movie selections to the three in-suite lighting fixtures (which each include three brightness levels, letting you change the mood throughout the flight). 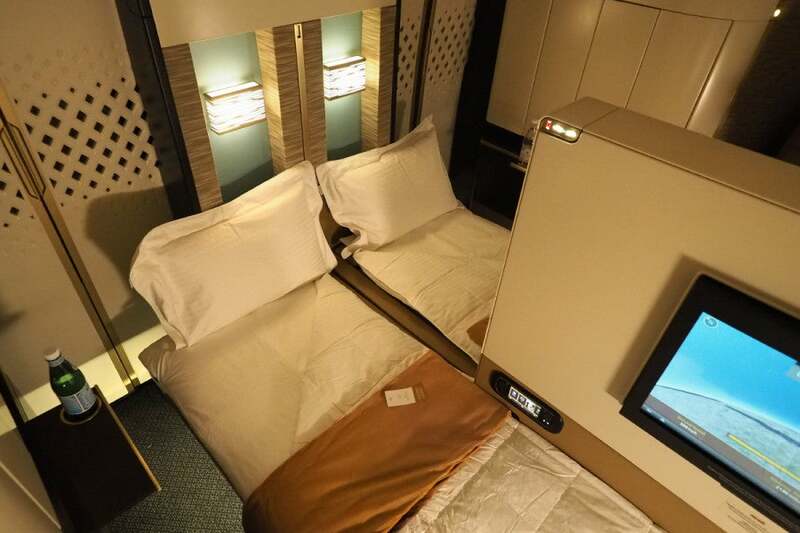 With the partition lowered, you can have an in-flight double bed. Before boarding, I had assumed that the highlight of the flight would be the “double” bed. Unfortunately, it’s not quite as comfy as it looks. I got to try out The Residence bed for a few minutes, and while that was definitely comfortable enough to get a good night’s sleep, The Apartment bed felt more like a futon that could have benefited from a bit more padding. It was stiff, and a bit of a disappointment overall. Each Apartment includes a large vanity, where the amenities (and bag) are stored. 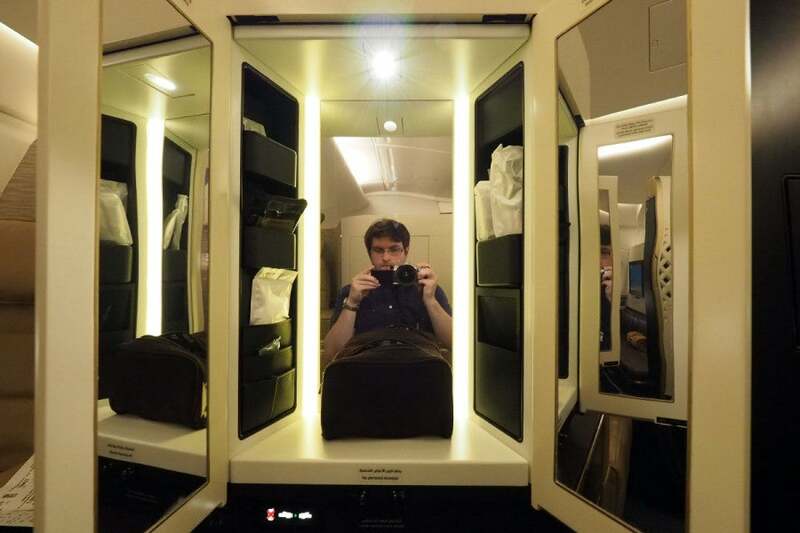 Etihad made quite a fuss about the vanity, which, I’m sorry to say, was lost on me. I suppose it’s a great help if you need to apply makeup before landing, but otherwise it’ll likely remain hidden away. 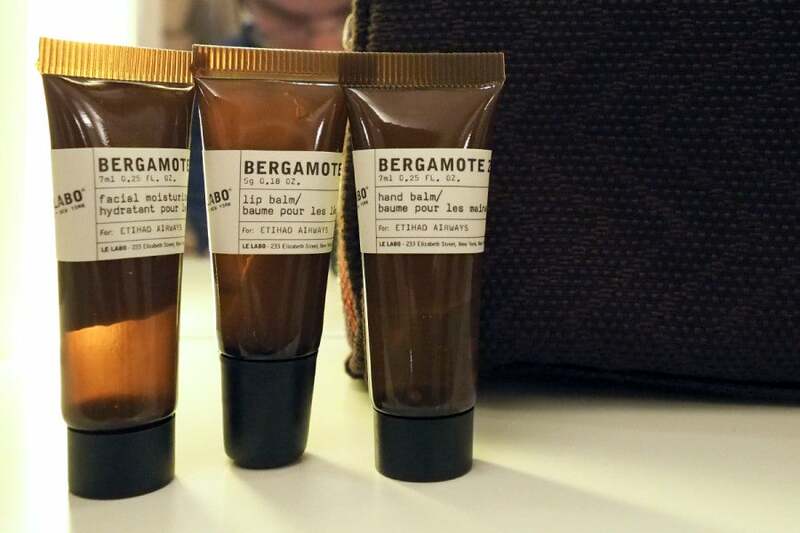 With small Bergamote 22 toiletries, the provided amenities are nice, but not over the top. The amenities were placed in designated compartments in the vanity before we arrived, with a high-quality (and empty) pouch sitting front and center. There’s a huge 24-inch touchscreen display. I typically watch 2-3 movies on a long-haul flight, but with so much excitement on board (and Wi-Fi available to catch up on work), I only made it through the first hour of While We’re Young. The entertainment selection isn’t as comprehensive as what you’ll find on Cathay Pacific or even domestic US airlines, but I didn’t mind. 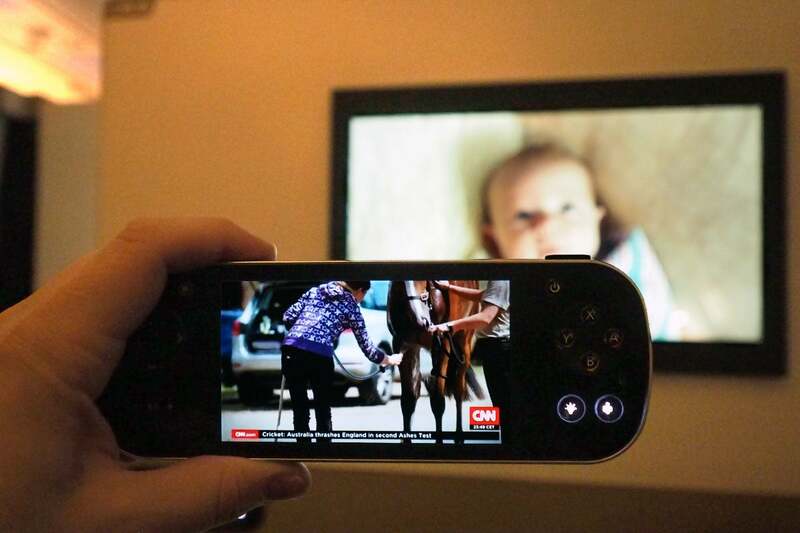 You can choose from hundreds of movies and TV shows, and even several channels of live TV, including CNBC and CNN. The live TV was a bit of a novelty. You can choose from several satellite channels, including BBC, CNBC and CNN. Like with the rest of the programming, you can watch on the main screen or your handset, or you can have content on both if you’d like (handset audio appears to override the TV). Located between business and first class, the lounge has plenty of room to stretch out. 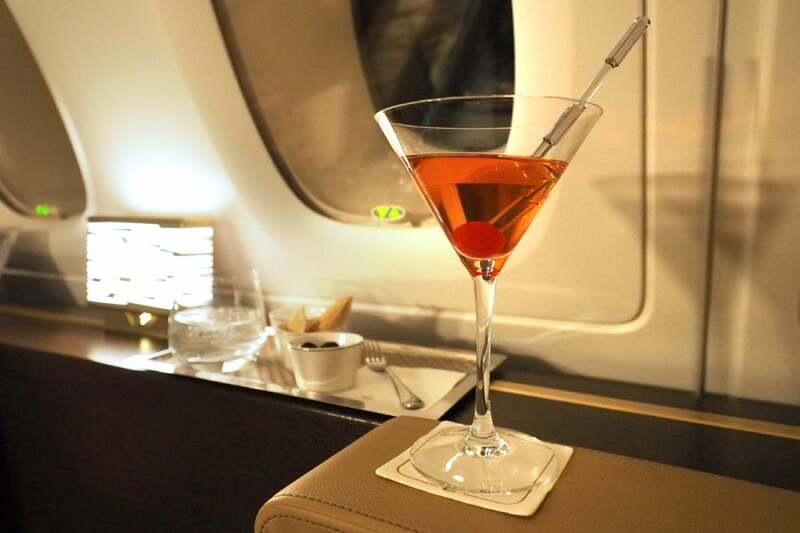 Of course, one highlight of some of the most decked-out A380s is the in-flight bar — or in this case, “The Lobby” (but we’ll just call it a lounge). Etihad’s lounge is located between the first and business-class cabins, so it’s accessible to all passengers on the upper deck. There’s seating for six, but I never saw more than two other people in there at a time during the entire flight. You can browse through the liquor selection and then ask a flight attendant to mix you a drink. You can also have a meal in the lounge if you’d rather eat there than at your seat. I tried a steak sandwich (which was delicious), and later in the flight I had a pot of tea. With Wi-Fi available throughout the plane, I decided to set up shop in the lounge for a few hours. Even though The Apartment is roomy for an airplane seat, it’s still an airplane seat. I preferred to get work done in the lounge, instead, since I had access to the same Wi-Fi connection from there. Upon boarding I received a small bowl of dates and a glass of Duval-Leroy Rose Champagne. I had more dates on this trip than in all the rest of my years combined. We had a handful in the lounge, and then when we boarded, we got more dates. This time, they were paired with Duval-Leroy Rose Champagne, which runs about $50 per bottle on the ground, and a welcome note from the crew. After takeoff, I switched to the 2005 Bollinger La Grande Annee, which averages roughly $100 per bottle. While not the most high-end Champagnes, both were perfectly adequate for first class. Of course, the booze kept flowing after that. I ordered a Manhattan from the cocktail menu, and, since it was available in first class, I asked to have it mixed with Johnnie Walker Blue. It sounded great in theory, but the finished product wasn’t quite what I imagined. The Apartment is large enough to dine with a companion. In first class, you can eat whatever you like, whenever you like. And if you’re sitting in an Apartment or The Residence, you can dine with your companion. 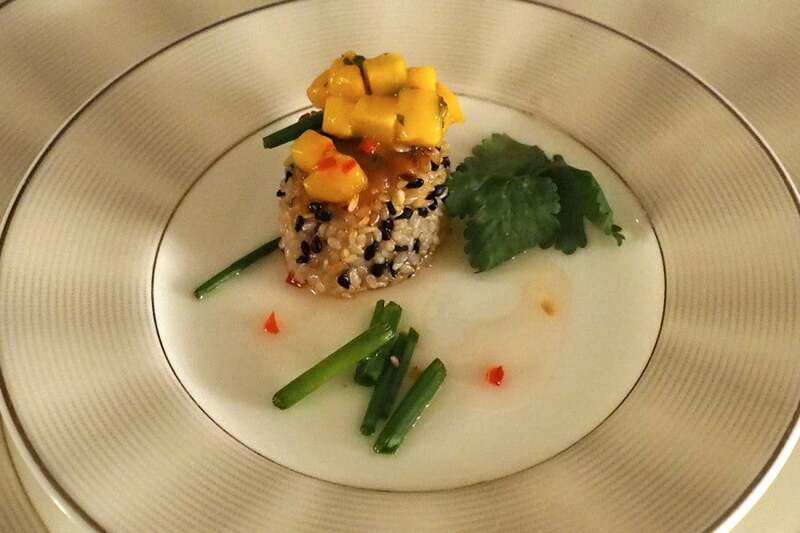 The fantastic sesame-crusted scallop appetizer was the highlight of the meal. I ordered the mezze platter as my starter, which was large enough to share. Next, I had the mezze platter, which was a bit more quantity over quality. Everything tasted alright, but the snacks I had in the lounge tasted fresher. 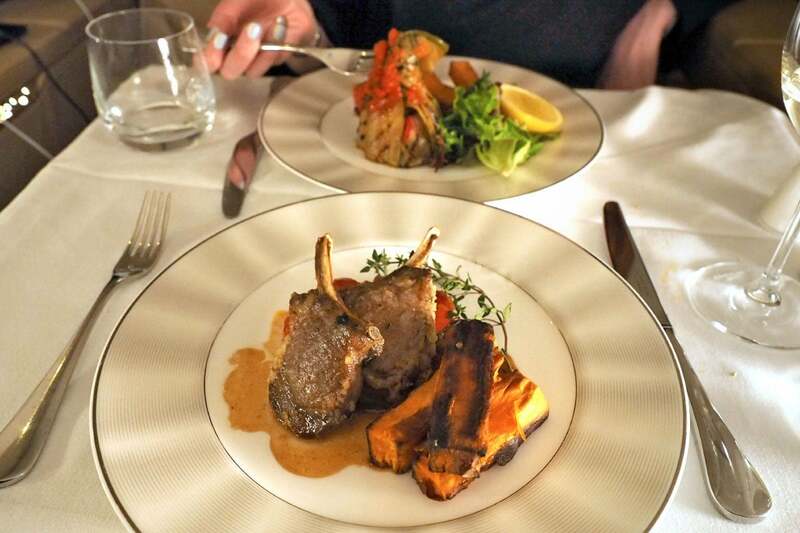 The lamb chops were tasty, but a bit on the mushy side. I opted for the lamb chops, which, while flavorful, were a bit more mushy than I would have liked. I also ordered it with broccoli, which didn’t arrive until after I followed up. Since Sarah hosted dinner in her Apartment, breakfast was served in mine. Then, we had a nice 10-hour rest before the next full meal. While I went to Sarah’s Apartment for dinner, she came to mine for breakfast, so I could try a meal from the larger (and comfier) first-class seat. Breakfast included a starter of fresh fruit. We ordered fruit and a smoothie to start. As you can see, I was so thirsty I forgot to take a picture before downing the smoothie. Both tasted great. We both opted for fresh-cooked omelettes, which were a bit bland. 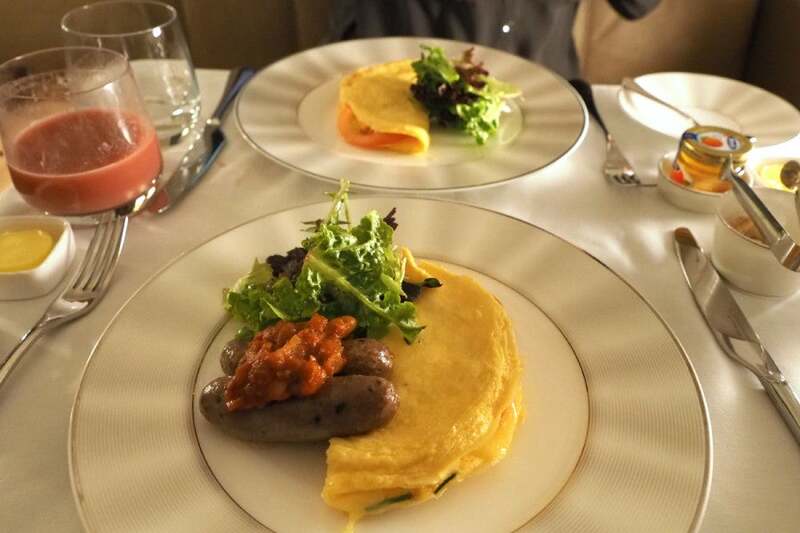 Then, for our mains, we both ordered omelettes with cheese and tomatoes. The tomatoes were sliced (like you’d get on a sandwich) and a bit hard, while the omelette was slightly dried out by the time it arrived. My sausage was moist and delicious, though. The main lavatory is large enough to change and wash up comfortably. 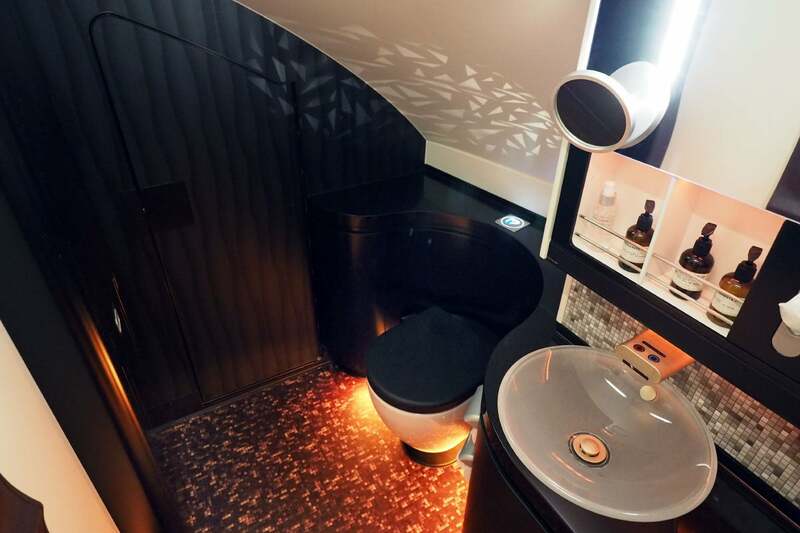 You’re probably not going to choose an airline based on the size and appearance of its lavatories, but it definitely factors into the overall first-class experience. 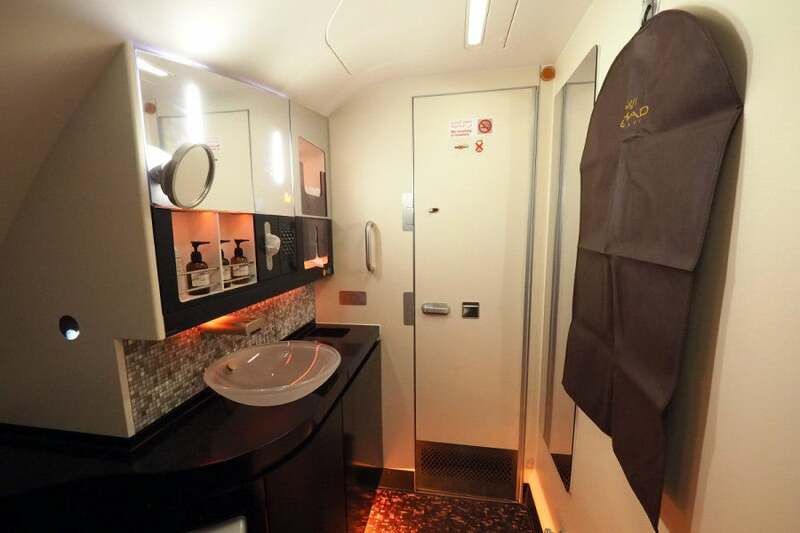 Etihad has two first-class lavatories on the A380, plus a private lav for passengers in The Residence. 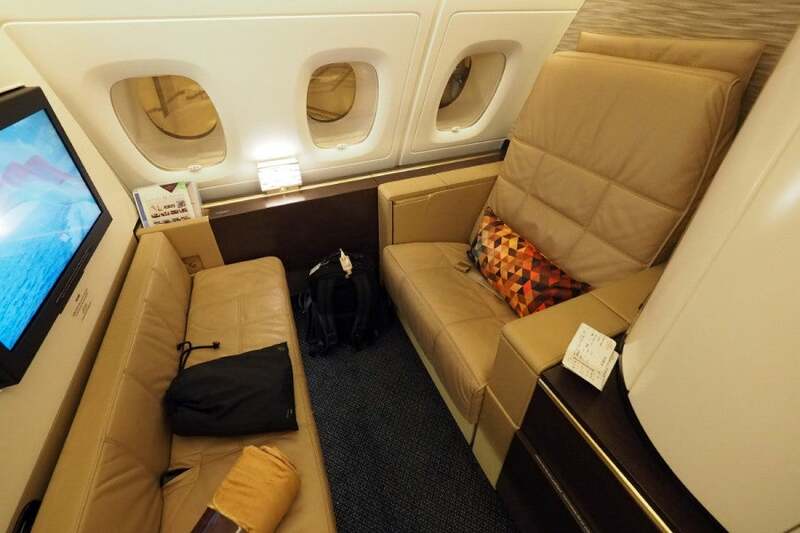 The main first-class lavatory occupies the same space as The Residence bedroom on the other side of the plane. The main lavatory is quite large, with plenty of room to change, wash up and move around. It’s stocked with Bergamote 22 amenities (just like you’ll find in the vanity), and it’s cleaned often throughout the flight. You can reserve time in the shower, which is shared by the nine Apartment passengers. And there’s a shower on board! 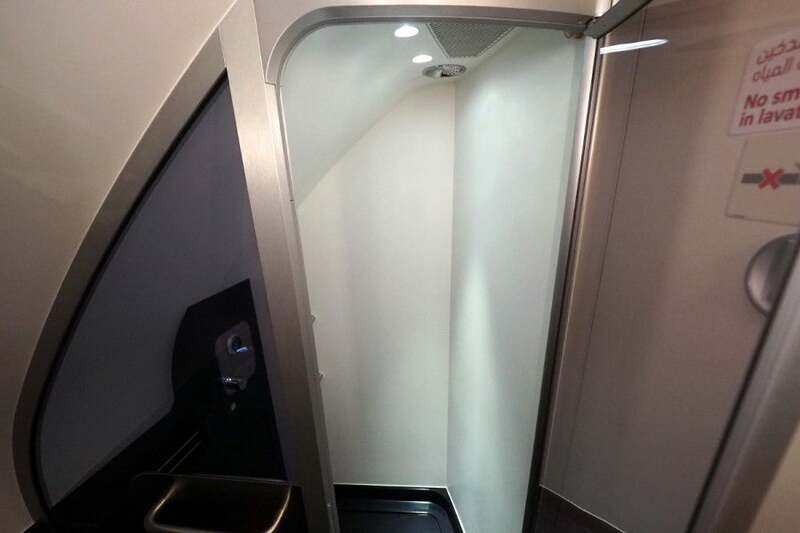 Etihad’s shower is located in the second (smaller) lavatory. There’s a second shower exclusively for Residence use (Apartment passengers can’t use it even when The Residence isn’t occupied). 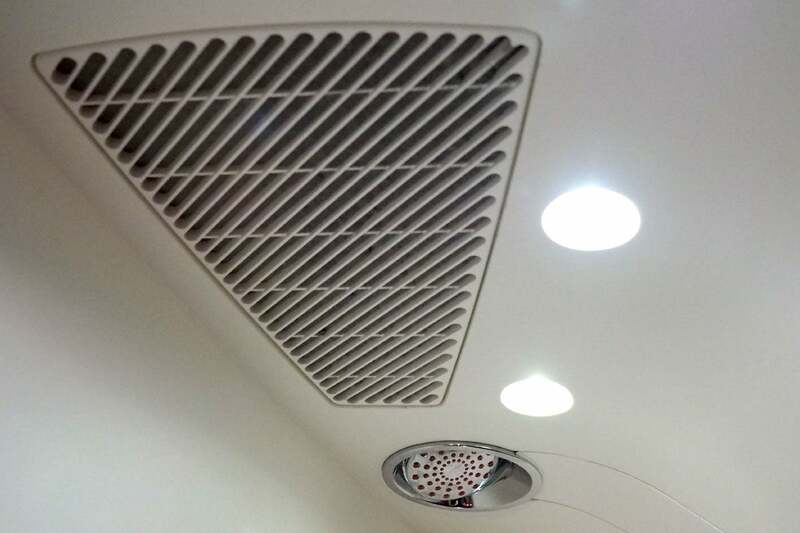 The shower head is fixed to the ceiling. This was actually the first opportunity I’ve had to shower on an aircraft, and it was definitely all it’s cracked up to be. 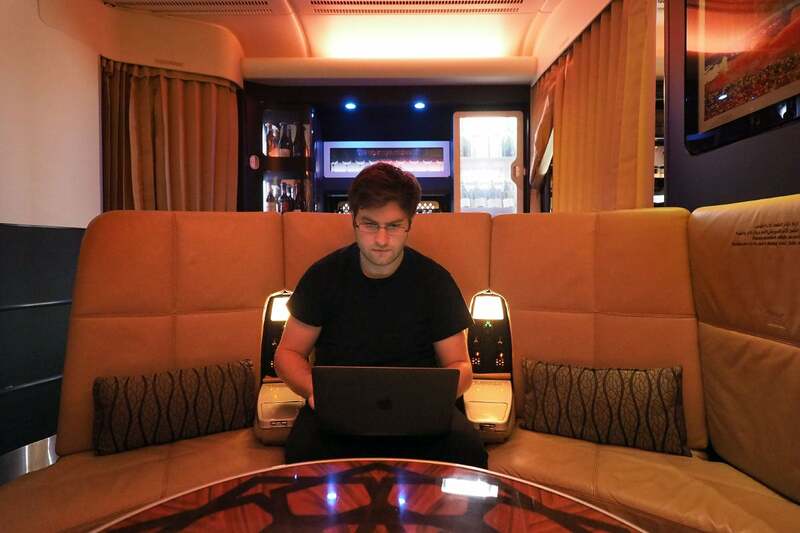 I almost always shower in the lounge after a long-haul flight, but since I had a chance to wash off on board, I was able to focus on stuffing my face and getting a free 15-minute massage in Abu Dhabi instead. As the A380’s water supply is limited, each passenger can have up to five minutes of water, but you can start and stop the flow as many times as you wish. Of course, since there’s a limited water supply on the A380, shower water is rationed. Each passenger gets roughly five minutes of hot water, but you can turn it on and off as many times as you need to by tapping that round black button above. 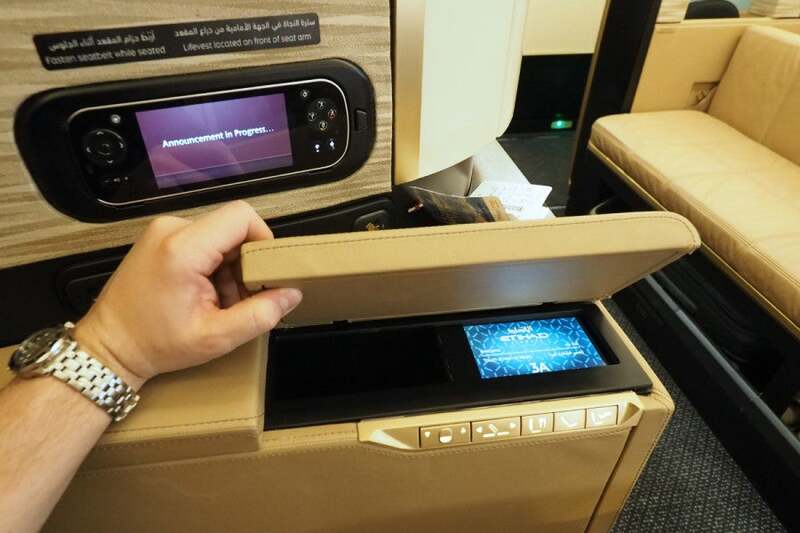 Etihad offers Wi-Fi on select long-haul flights, but performance can be hit or miss. 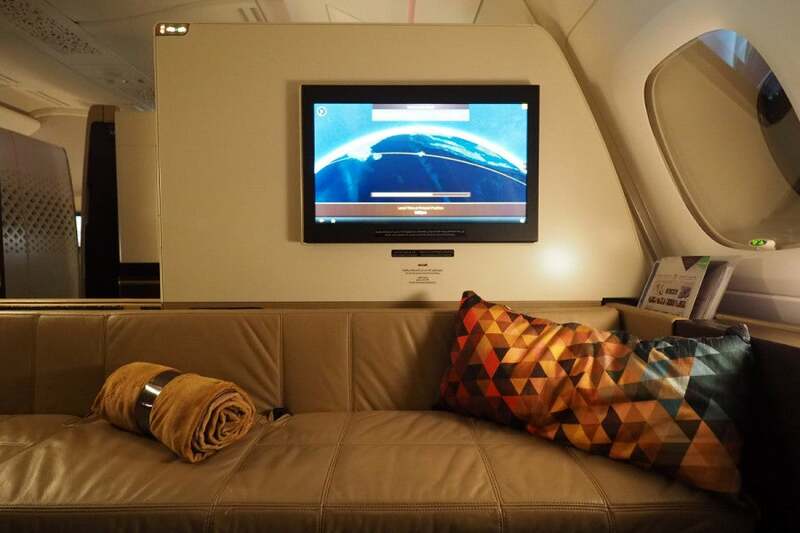 Etihad’s A380 offers satellite Wi-Fi, which should theoretically work for the entire flight. Of course, there are periods of downtime on many flights, but I found the connection to be offline more often than it was available. Still, with 14 hours on board, there was plenty of time to browse, post pictures and stay on top of email. Wi-Fi was priced between $12 and $22, depending on duration. Fortunately, the Wi-Fi was priced very competitively, so even though it wasn’t working much of the time, I didn’t mind too much. You’ll pay at most $22 for the flight, which is less than you’ll pay for many Gogo sessions within the US. Like I mentioned, the Wi-Fi worked throughout the plane, so you can use it from the lounge as well. 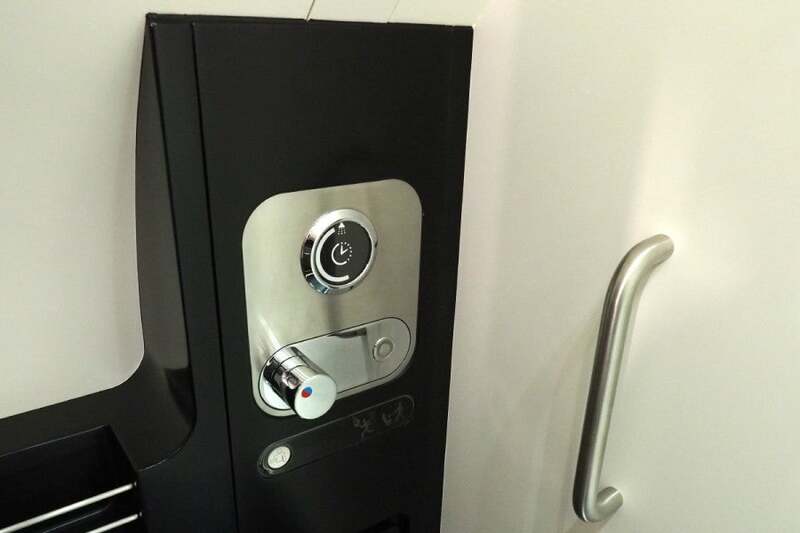 Business and economy passengers also have access. Speeds were fine, and on par with other satellite services, though the Wi-Fi on our United flight to Sydney was significantly faster and more reliable. 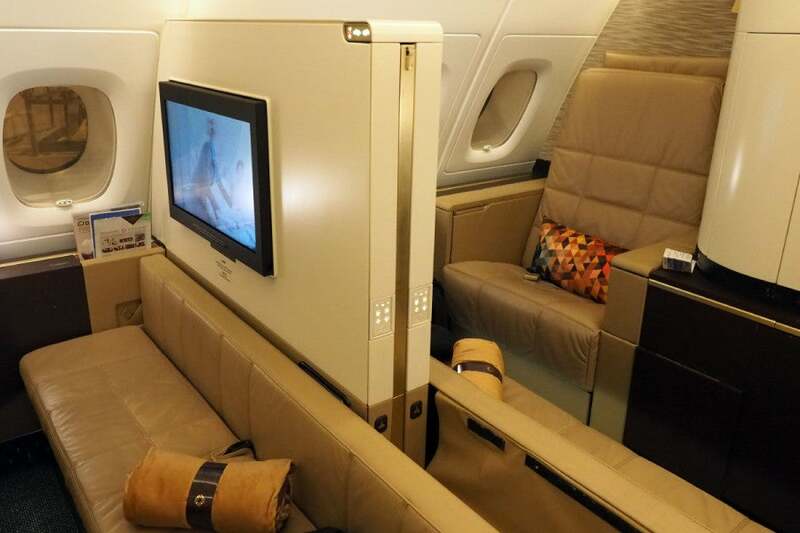 Beginning December 1, Etihad will begin flying its A380 to the US, so you’ll be able to book The Apartment between New York JFK and Abu Dhabi for 90,000 miles each way. With the exception of a first-class flight from the US to Africa, that’s the most you’ll spend on an AAdvantage redemption, though it’s far less than you’d pay for a similar flight via United MileagePlus, and Delta doesn’t allow first-class redemptions at all. We received a personalized cake just before landing (likely arranged by Etihad’s PR department, since I had reached out about Residence access). 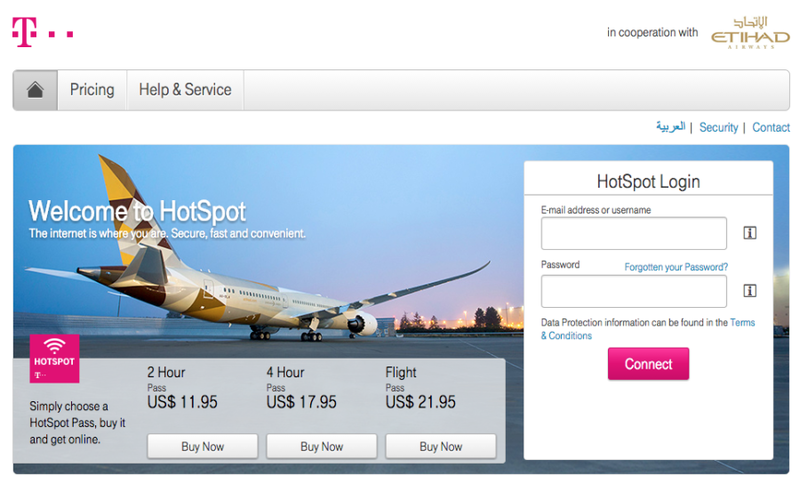 Alternatively, you can book The Apartment using Etihad Guest miles, but you’ll get a better deal through AAdvantage. A one-way flight from New York to Abu Dhabi will run you 117,556 miles plus $179, while a one-way flight from Sydney to Abu Dhabi costs 128,818 miles plus $290 AUD (about $215). A one-way flight from London, meanwhile, can be had for 87,543 miles plus £281 (about $440). Note that Etihad Guest redemption amounts recently increased significantly. Update: As one reader pointed out, low-level availability for the Sydney route, which is required for AAdvantage redemptions, is incredibly limited at the moment. 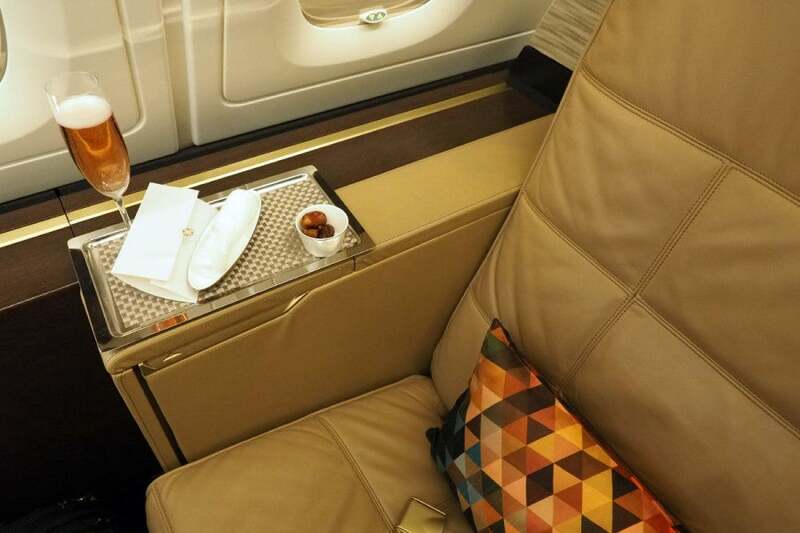 Etihad first-class availability seems to come and go often, however, so keep checking Etihad’s redemption site for “Guest First” availability, which can be booked through AA. Ultimately, we had a fantastic flight in The Apartment. 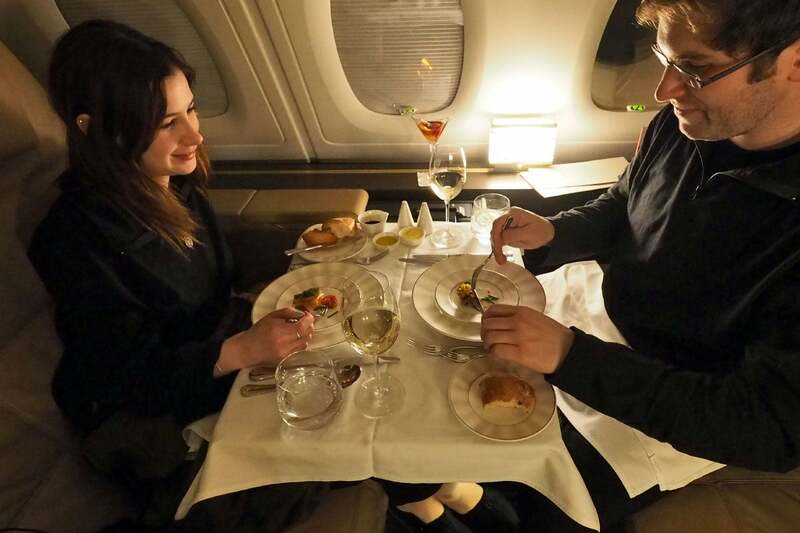 I’ve been fortunate enough to travel in some of the industry’s best first-class cabins, but I have to say that Etihad’s A380 was my most enjoyable 14 hours in flight. 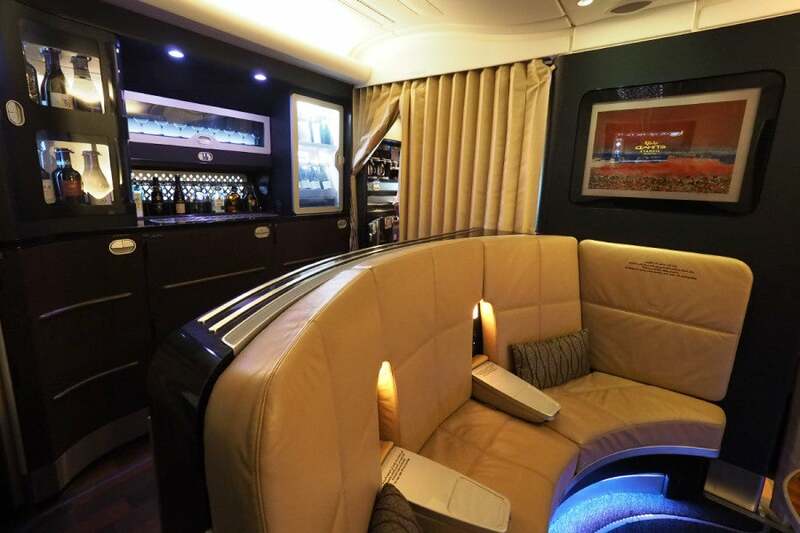 The crew was phenomenal, the suite was incredibly spacious and the aircraft is gorgeous. The food could benefit from some tweaks and the Wi-Fi definitely needs some work, but the pros far outweigh the cons on this aircraft. That said, I was most disappointed with the bed — it wasn’t nearly as comfortable as, say, the bed on Lufthansa’s 747-400, though a thick mattress topper (or sofa topper, in this case) could help. 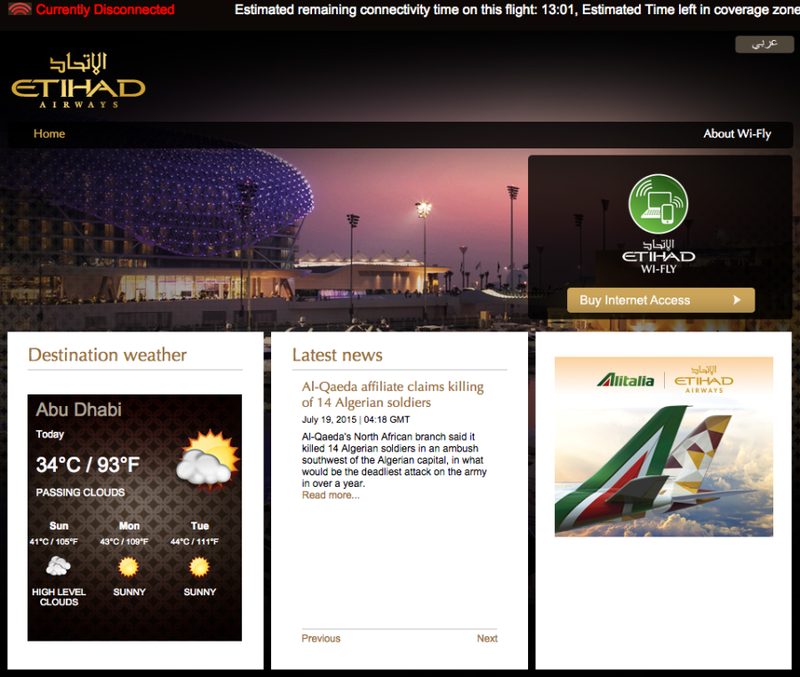 Overall, Etihad nailed it with the A380. The airline took full advantage of the aircraft’s potential, delivering unparalleled passenger comfort in a product that’s more accessible than you’d think. And at just 60,000 American AAdvantage miles from Sydney to Abu Dhabi (or 40,000 from London or 90,000 from New York), it’s an absolute steal.